First of all, let me say that I think I need to be on a Thorazine drip for taking on this card in the manner in which I did. Do you see that flower? It took me an hour to do all that cut work! Crazy!! Several years ago I attended a crop. At this crop there was a young couple there, it was really cool to see a husband and wife tag-teaming the scrapbooking while taking care of their baby. This man amazed me. Not that he was into scrapbooking WITH his wife, but the wonderful things he created with his X-Acto knife! That man could do precision cut work with his craft knife that would compete with any laser cut piece I've ever seen. I thought he was nuts! But did admire his work. I can't do near what he could, but I am pleased with how this turned out. I did use the sketch from Sketches by Tamara. Great sketch! Where I put the flower is supposed to be a sentiment, so I'm not sure if this will qualify for her challenge, but it was fun anyway. Edit: I missed the challenge on that sketch anyway! I keep forgetting to look at my dates!! And thanks to a friend to point me into another direction for a different challenge, I submit this to My Time to Craft Challenge. I do hope you like my card. Lindsay released a brand new set call Seaside Sketches and it's beautiful. Be sure to head on over to Lindsay's blog to see what she has in store for you and I know the team has some great stuff to share with you, too. Thanks for stopping by! And be sure to come back to my blog later on today for Soft Pencil's Anniversary blog hop. This card is fabulous Melissa! Love the bold bright colors. Your cutting efforts defintely worked. Wow stunning! I love the orange and the way you did the fold! I'm more impressed that you got your husband to help with it than anything though! haha. Wow! Love these blod colors...so striking! Wowza! 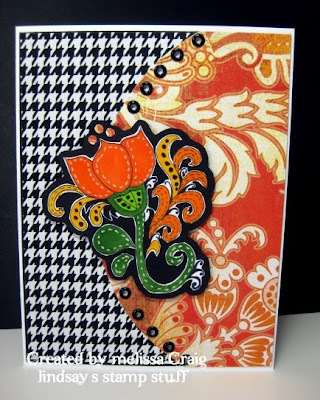 Wonderful card - I love these colors. Orange is one of my favorite colors, Love this wild card! This is gorgeous, and is so bright and summery! Ooooh! this is a fabulous card. I love the colours! love the detail work and how you backed the flower with black- it pops! Fabulous! You do pretty amazing work with your knife or scissors, too! I'm always amazed by how neat all your cuts are and this is no exception! Love the colors!! I think you did a awesome job cutting it out to! TFS! !